Through the Hawaiian Legacy Reforestation Initiative, a nonprofit organization that has led the reforestation of more than 400,000 native and endemic trees on Oahu and the Island of Hawaii, the Hawaii Convention Center has committed to planting 1 million Legacy Trees across the state. Fewer than 10 percent of Hawaii’s old-growth native and endemic forests remain. Join us as we support these vital reforestation efforts. With a few clicks, you can sponsor and dedicate a Legacy Tree, track its development, and help Hawaii grow a brighter future. Planted in the original Legacy Forest on the Island of Hawaii, your sponsored koa tree will grow to more than 50 feet in its natural environment, offsetting the carbon footprint of a typical vacation to the islands for a family of four. This beautiful tree, prized throughout Hawaiian history, provides a habitat for numerous rare and endangered species. 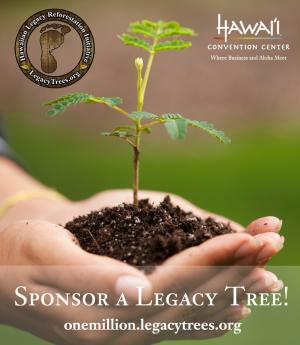 Visit onemillion.legacytrees.org to sponsor and dedicate an individual koa Legacy Tree or group of trees at a special price for Hawaii Convention Center guests. You will receive a high-quality certificate with the RFID tracking information and dedication details for each tree. Input your code online to watch your Legacy Tree as it grows with a regularly updated, high-quality aerial map supported by TreeTracker technology. You can also visit the Oahu and Island of Hawaii Legacy Forests to plant your own ohana (family) tree. Visit hawaiianlegacytours.com for more. This special initiative was launched in 2016 and is part of the Hawaii Convention Center’s ongoing commitment to environmentally sustainable operations.